NOVEMBER 22--With today marking the 42nd anniversary of the murder of John F. Kennedy, TSG has gathered an assortment of documents and photos detailing aspects of the killing, material released by the federal Assassination Records Review Board. 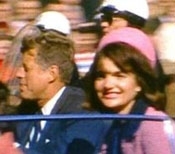 The following selection of documents touches on everything from JFK's autopsy and a cop's notes of his post-arrest interviews with Lee Harvey Oswald to the bill for the late president's casket and a photo of Abraham Zapruder's camera. Submitted by PennyKennedy on Fri, 2010-08-13 08:40. Why am I not able to access the interrogation notes of Lee Harvey Oswald. I was told by my instructor at the University of Phoenix to read these notes but your system will not let me access them.